The Omega Nebula (also known as the Swan Nebula, Messier 17 or NGC 6618) is an H II region in the constellation Sagittarius. It was discovered by Philippe Loys de Chéseaux in 1745. Charles Messier catalogued it in 1764. It is located in the rich starfields of the Sagittarius area of the Milky Way. Earth's distance to the Omega Nebula is between 5,000 and 6,000 light-years and it spans some 15 light-years in diameter. The cloud of interstellar matter of which this nebula is a part is roughly 40 light-years in diameter. 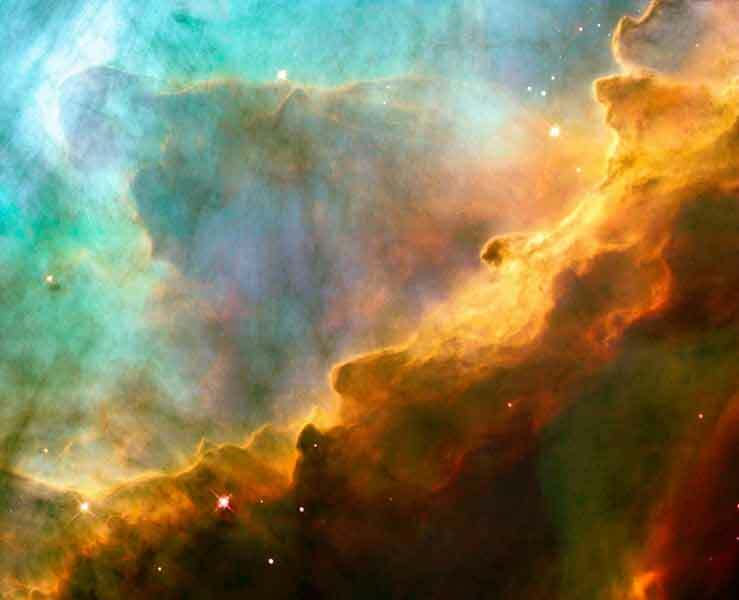 The total mass of the Omega Nebula is an estimated 800 solar masses. A cluster of 35 stars lies embedded in the nebulosity and it is these hot, young stars' radiation that excites the gases in the nebula to shine. 1. ^ a b c d SIMBAD Astronomical Database. Results for NGC 6618. Retrieved on 2006-11-16.